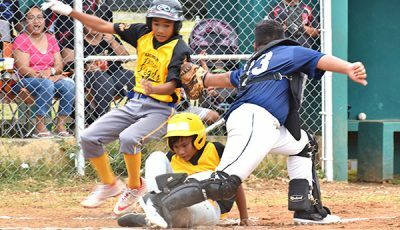 The Kagman Little Legals recovered from a rough start to beat McDonald’s, 5-2, during their Majors division game in the 2019 Saipan Little League Baseball last Saturday at the Capital Hill Ballfield. 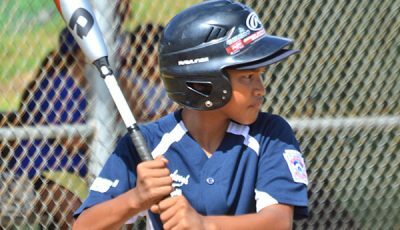 The Little Legals were without a run in the first three innings before making it to the board with a four-run top of the fourth. They added one more in the fifth and then finished off McDonald’s in the sixth and last inning with relief pitcher Austin Diaz getting the third strike for the third out with the bases loaded. Starting pitcher Albert Adriano broke the Little Legals’ silence when he singled, advanced to second and third off McDonald’s errors, and stole home. 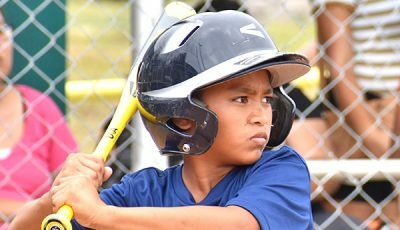 Ryan Dela Cruz made it a 3-0 lead with a two-run double and he also reached off a RBI walk from Brandon Babauta to lift the Little Legals to a 4-0 advantage. The defending champions increased the lead to a 5-0, courtesy of Diaz’ RBI single at the top of the fifth inning, while McDonald’s still could not end its dry spell at the bottom. A 1-2-3 at the top of the sixth inning gave McDonald’s the final chance to mount a comeback and it seemed it is headed for one with Kazu Dela Cruz’s double driving Dillon Santos home. Dela Cruz then handed McDonald’s its second run, as he reached off Lance Acosta sacrifice’s out. With two outs and runners on second and third, McDonald’s loaded the bases and boosted its bid for a late rally after Diaz walked Champ Aldan. Next up to bat was Jordan Agulto and he came up with an empty swing for the first strike before letting go off a high pitch to stay ahead. The McDonald’s batter then hit a foul ball for the second strike, while Diaz caught him looking in the next pitch, giving the Little Legals their second win in as many games. 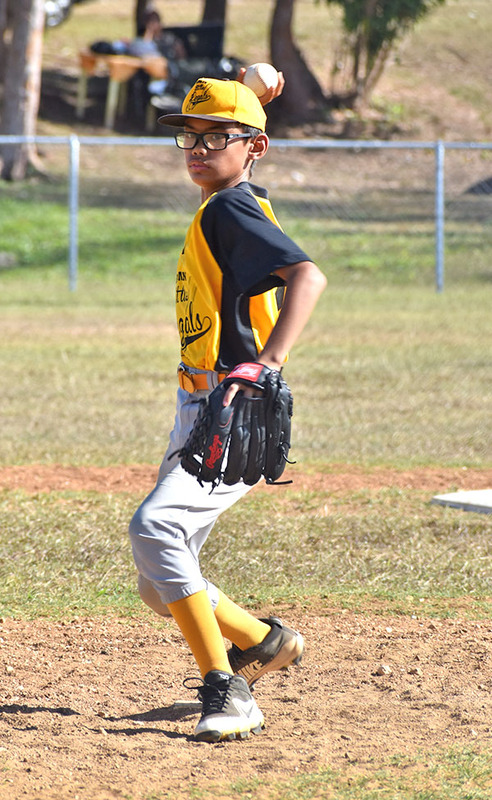 Adriano worked the mound for 5.2 innings, gave up five hits and fanned eight batters. Diaz struck out two batters and threw a no-hitter in a good closing job. The NSA Braves were on target right in the first inning for another easy victory in the second week of the competition. The Braves, who routed the Blue Jays in their season debut, 15-1, scored seven runs at the bottom of the first inning of their match versus the defending champions Marlins to set the tone of the game. Leadoff batter Damian Marchadesh kicked things off for the Braves, as he reached off a passed ball from Nate Seman. The Braves went on to get four more runs off passed balls, while Mike Taitano had an RBI single and also scored on a Marlins’ error. After giving up seven early runs, the Marlins remained in contention, as they logged four runs at the top of the first. However, that was the best that the reigning champs could do, as Braves pitcher Alden Magofna found his rhythm and allowed only one hit in the last three innings and an unearned run (Kyle Laniyo) at the top of the fourth and last inning. The Braves pitcher finished the match with seven strikeouts and got two runs. The rest of the Braves’ defense also picked up in the final three innings after committing miscues in the first to close out the match after only three and a half innings. The Braves delivered six runs at the bottom of the third to press the Marlins to score at least 11 runs to continue the game. 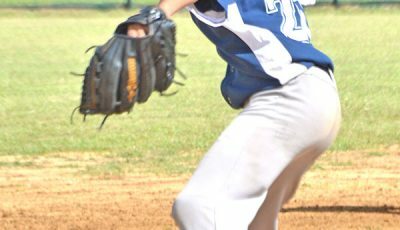 Minor division matches are only four innings.